Those calling for the removal of Confederate monuments are often accused of faddish political correctness, but African Americans have been objecting for more than a century. 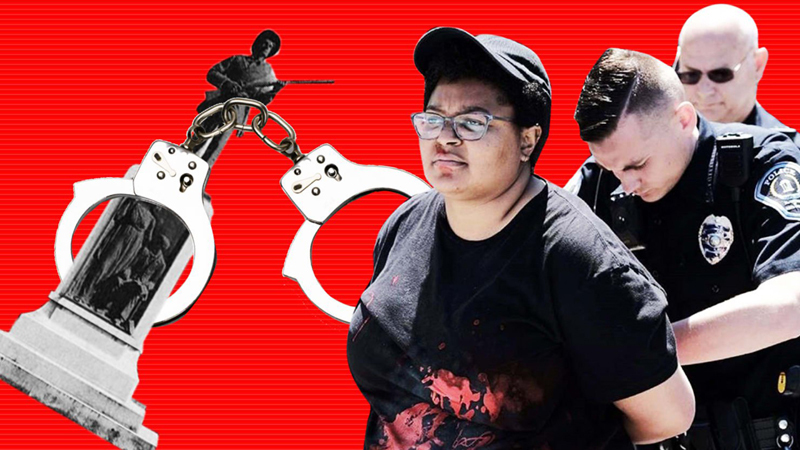 On April 30, Maya Little, a graduate student in history at the University of North Carolina at Chapel Hill, was arrested after she smeared red ink—and her own blood—on Silent Sam, an embattled Confederate monument installed on the campus by the United Daughters of the Confederacy in 1913. She was charged on May 7 with defacing a public statue. If found guilty, she could be sentenced to up to 60 days in jail. Little characterized her defacement of the statue as the latest salvo in a black student campaign against Silent Sam that dates backs to the ’60s. Others have connected Little’s actions to the wave of protest and vandalism against Confederate symbols that has swept across the country since an avowed white supremacist murdered nine black parishioners at Emanuel AME Church in Charleston, South Carolina, in 2015. Just ten days after that tragedy, African American activist Bree Newsome climbed a flag pole at the South Carolina capitol in Columbia and removed the Confederate flag that had flown there since the early ’60s. To some extent, Little’s and Newsome’s acts of civil disobedience reflect our post-Emanuel moment. Yet they have deeper roots—roots that stretch back not just to the civil rights era, as Little suggested, but to the late 19th century. And then, as now, it was often young people and women who led the struggle against white supremacist monuments. The prominence of African American women in the long battle to topple these memorials is particularly notable. After all, it was primarily their white counterparts, working through groups like the United Daughters of the Confederacy, who made sure they were erected in the first place. Ground zero for this earlier outburst of cultural protest was Charleston, the site of the Emanuel massacre, the capital of American slavery—where close to 50 percent of the slaves brought to the United States first stepped foot on our shores—and the birthplace of the Civil War. As we chronicle in our new book, Denmark Vesey’s Garden: Slavery and Memory in the Cradle of the Confederacy, Charleston’s Confederate and proslavery memorials have long been vandalized. In 1908, residents strolling through White Point Garden were “astonished” to find that the bust of poet William Gilmore Simms, a strident supporter of slavery and secession, had been streaked with vermillion and green paint. Charleston’s many memorials to John C. Calhoun, the South Carolina statesman who famously called slavery “a positive good,” have attracted the most attention from opponents. In the final months of the Civil War, a freedwoman destroyed a bust of Calhoun that sat in the office of the Charleston Mercury. Meanwhile, visiting New York minister Henry Ward Beecher noticed that “vandal hands” had chipped off portions of the marble slab that lay atop Calhoun’s tomb in St. Philips’ Church cemetery. And for more than a half-century, black Charlestonians took aim at the city’s two Calhoun monuments, both of which were erected by the Ladies’ Calhoun Monument Association. In 1887, these elite Charleston women unveiled the original statue in Marion Square. Nine years later, they replaced it with a much larger one that still towers over the park today. African Americans sometimes used the first Calhoun statue for target practice. In 1894, a black boy was arrested for shooting a white toddler in the head with a tiny pistol. He told the police that he had not intended to harm the child—who was not seriously injured—but rather to hit the monument. It’s unclear if African American defacement was, in fact, responsible for the decision to install the taller monument, though it likely played a role. What is certain is that the second Calhoun monument—which soars more than 100 feet in the air—was a target, too. City officials repeatedly tried to safeguard the memorial with fencing and lights and asked police to patrol the square to protect against attacks that typically came under the cover of darkness. But these measures had little effect. “Wanton mutilation by unknown persons,” as the city put it, prompted repairs to the second monument as late as 1946. Today, some defenders of Confederate monuments denounce critics with cries of “political correctness,” trivializing their objections as the overreaction of a new generation of liberal snowflakes. This is far from the case. As Charleston’s history demonstrates, from the beginning African Americans have clearly understood the function of—and have loathed—these monuments. And from the beginning, it was frequently the least powerful members of the black community—women and young people—at the forefront of the effort to bring them down. Maya Little and her fellow students carry on this protest tradition, though under different conditions. They can operate in the open; indeed, Little’s protest was a deliberately public spectacle, broadcast by supporters on social media. It remains to be seen, however, whether the visibility and visceral nature of her actions will convince white America to finally listen to what African Americans have been saying since the end of the Civil War. The fact that she has received multiple death threats in recent days is a terrifying indication that it will not be easy.